It has to be said — bison (buffalo) are the strangest looking creatures I’ve ever seen. Lumbering, huge and potentially quite aggressive when with their calves, they seem to be everywhere at Yellowstone National Park. After the stunning beauty of Glacier and Waterton Lakes, at first I wasn’t as impressed with Yellowstone. 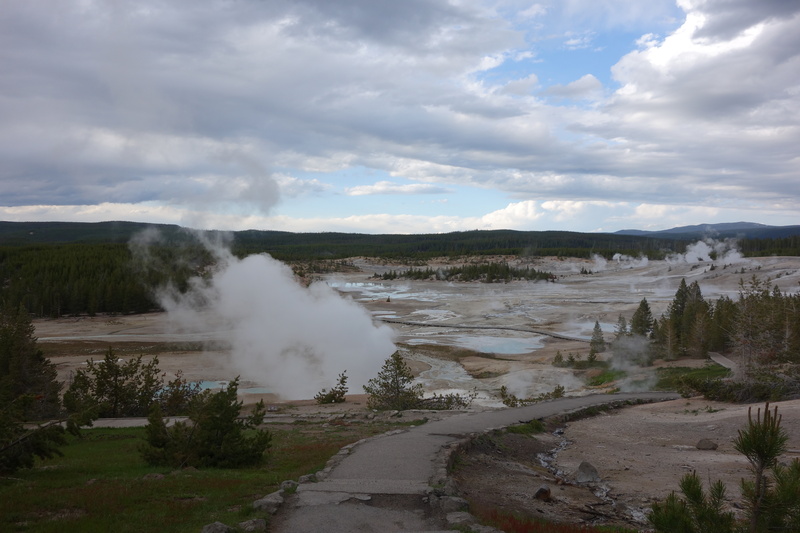 It seemed dry and dusty when we entered from the north, at Mammoth Springs, and a lot busier than our earlier stops. However, it didn’t take too long to understand this place was totally unique. 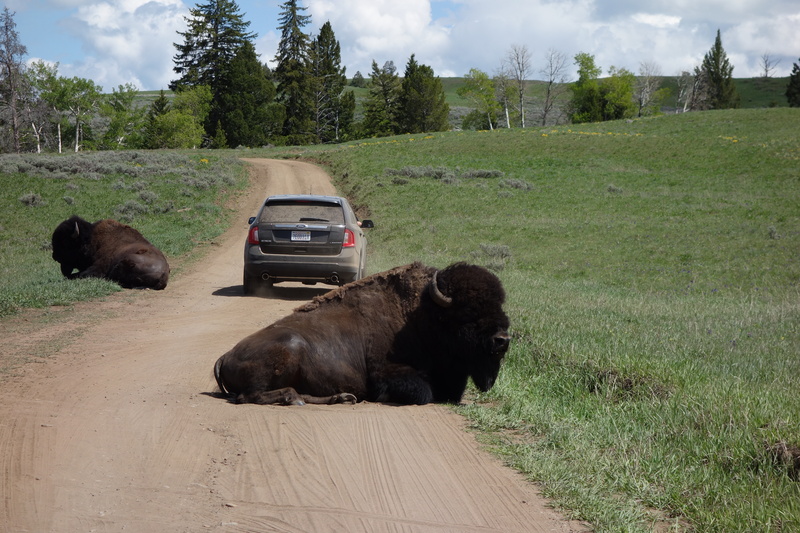 In a few hours, we travelled through valleys and plains, biked to the base of Mt Washburn (the trail all the way to the top was still snowy), saw bears (and the traffic jams they cause as people literally stop on the middle of the road to take photos) and of course, herds of buffalo, some actually blocking the road. Yellowstone is built well for vehicles (maybe too well? ), with two big driving loops that let you stop at the major attractions. 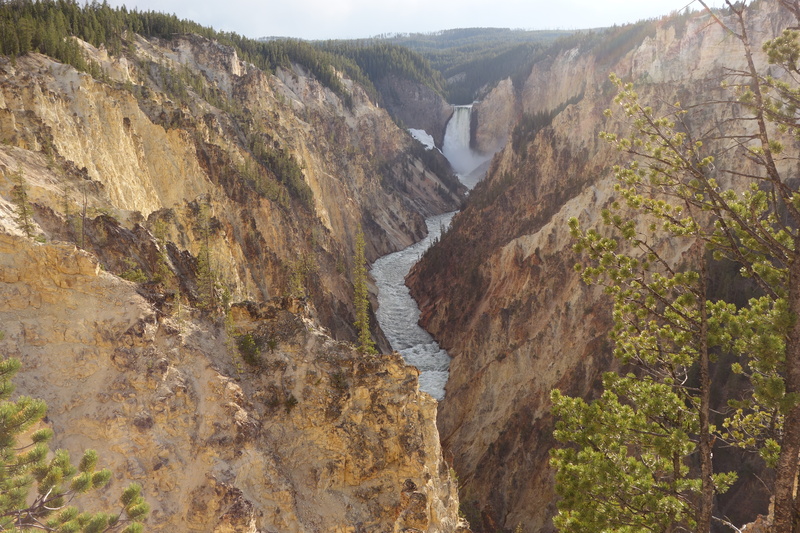 We were impressed by the spurting geysers, bubbling mud pools, and multicoloured hot springs on the western side of the park and the spectacular canyon in the middle of the park, where we managed a short-ish hike one day before the afternoon rain set in. But the biggest highlight had to be getting away from the crowds by exploring the backcountry. We rocked up at a ranger station, were given directions and advice on how to avoid bears, and then set loose into the wilderness with our packs. Our first day/ night at Slough Creek was amazing, with a long but fairly flat walk through a valley full of wildflowers, sagebrush and — of course — bison, where we didn’t see another soul for miles. When we finally did meet fellow hikers in the late evening, they warned us of a black bear on the trail. Although we were noisy, clapping and singing, we did run into it, accidentally getting a bit too close as we came over a hill while veering off trail to avoid some bison. The bear took one look at us, turned, and literally sprinted away. Even though it was more scared than us than we were of it, the fact it was only a kilometre or so away from camp made that night a little interesting (or terrifying)! Then just the next day, we somehow managed to corner at mama bear with two of the smallest cubs I’ve seen. With a group of hikers coming from the other direction at the same time, she must have felt trapped — but she definitely wasn’t scared, standing her ground and guarding her cubs. Somehow, we didn’t panic. We just backed away, talking in a soothing low voice, until she finally felt confident enough to cross the path and run up the hill with her babies. Although we saw another mum with cubs from the car later at Yellowstone, in person was a little too close for me! The second night backcountry was a lot easier. 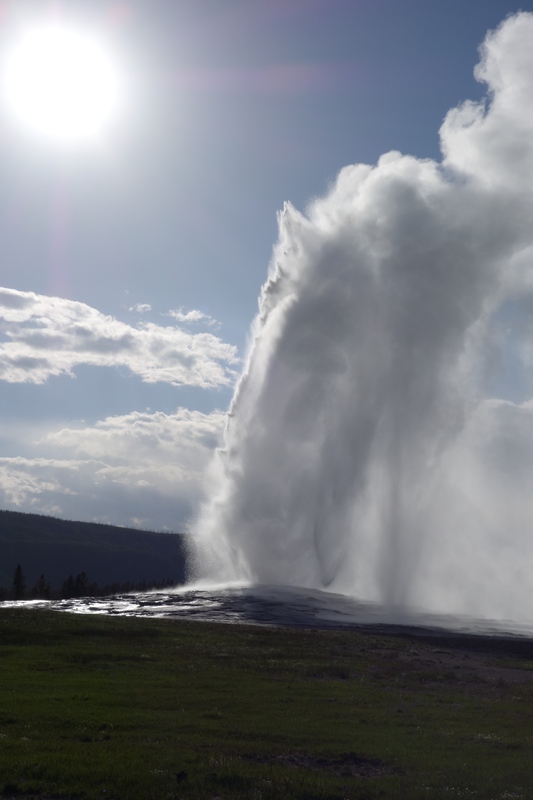 We only had to hike for about 20 minutes out to an open field, not far from the famous Old Faithful geyser. Maybe it was the perfect weather or beautiful sunset, or the fact we felt a bit safer out of the woods, but it was such a perfect night. We pitched our tent in the open, made a fire to enjoy our s’mores and wine, even with a coyote slinking by and howling from afar. 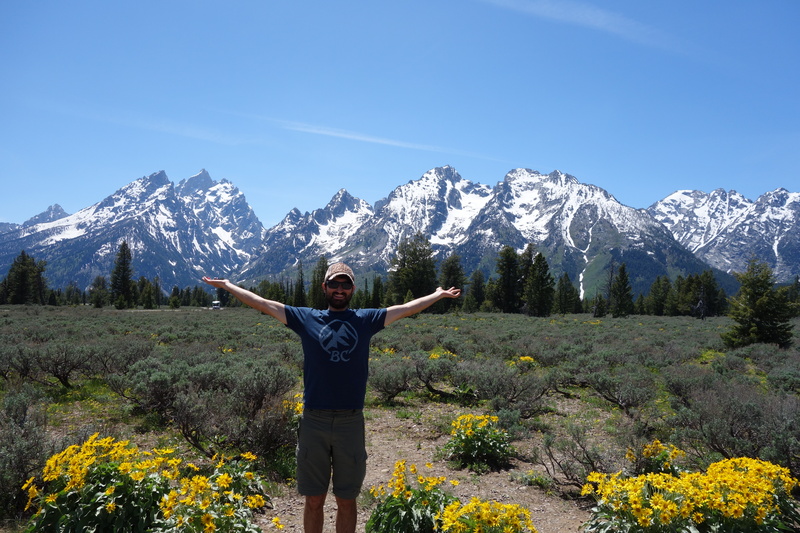 After spending four nights at Yellowstone, it was time to spend a night in Grand Teton National Park. 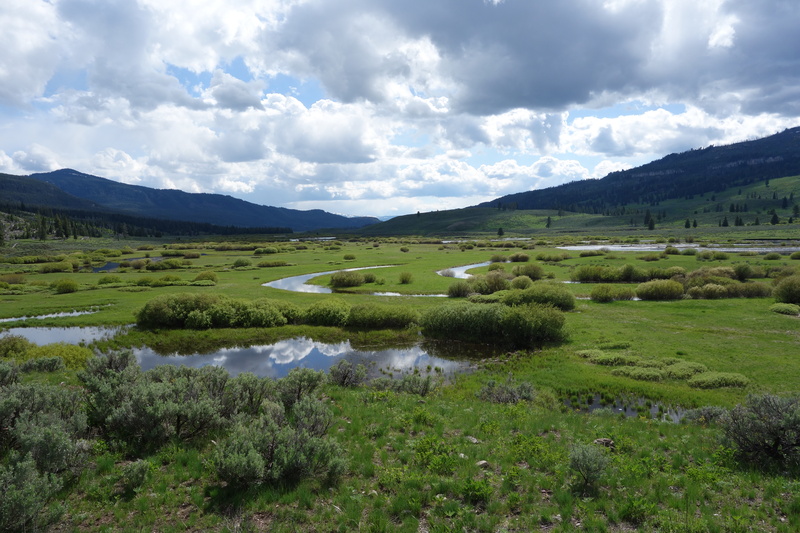 It was way quieter and felt more relaxed than the busy roads at Yellowstone. Again, this place was spectacular in terms of scenery — much like Glacier, with huge mountains and giant lakes set against drier plains peppered with yellow flowers. A stroll around Jackson Lake followed by a hike to Inspiration Point at Jenny Lake gave us more amazing views, but the bike trail from south Jenny Lake to the edge of the park gave us the best experience. We cruised by elk and even a moose, while the mountains towered around us. Now we’re in Jackson, Wyoming and making the most of civilization for a bit! Next up, we’re heading to Chicago via Mt Rushmore and Badlands… Lots of driving ahead! I’ve always imagined bison as super sophisticated, just very misunderstood.